Jimmy Lewis Striker SUP surf board – SUP, Windsurfing UK. Jimmy Lewis Striker sup surf is not trying to be like all these other crazy small sup surf shapes. It’s a classic shape that can cut a tight turn or be ridden on the nose. 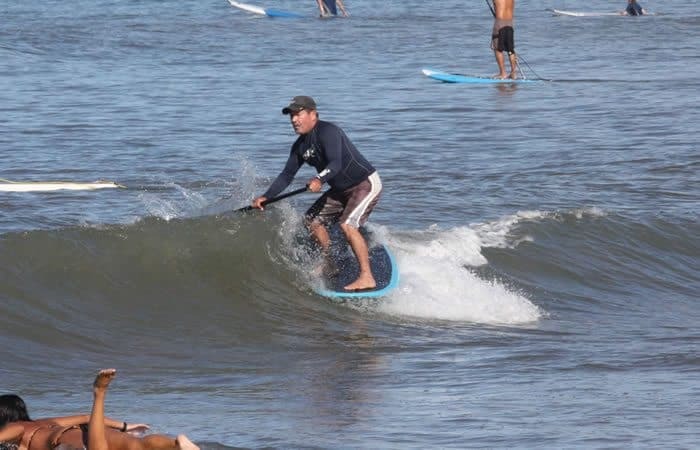 The Jimmy Lewis Striker sup surf board is an evolutionary board for many paddleboarders. The Jimmy Lewis Striker can take a total novice paddler and set them on the path to sup surfing, but at the same time will release aggressive performance for more advanced paddlers and sup surfers. 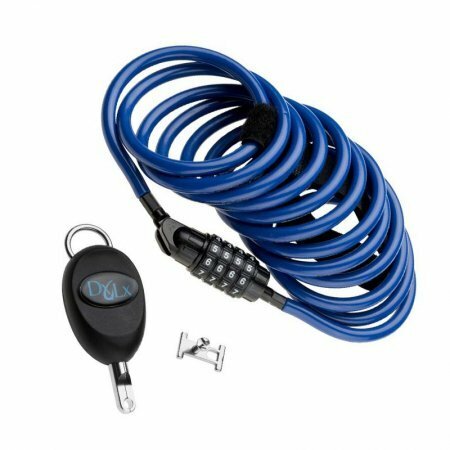 Both models offer high performance on the wave, but Jimmy has made sure it isn’t as challenging as something like the Supertech or Stun Gun. What really stands out about the Jimmy Lewis Striker is the full length deck pads that allow you to ride long board style and hang out on the nose as well as jumping back for some short board slashing. It is win win really with 2 in 1 performance. The Jimmy Lewis Striker is an everyone performance board – you don’t need to be an expert or an athlete to keep your hair wet. 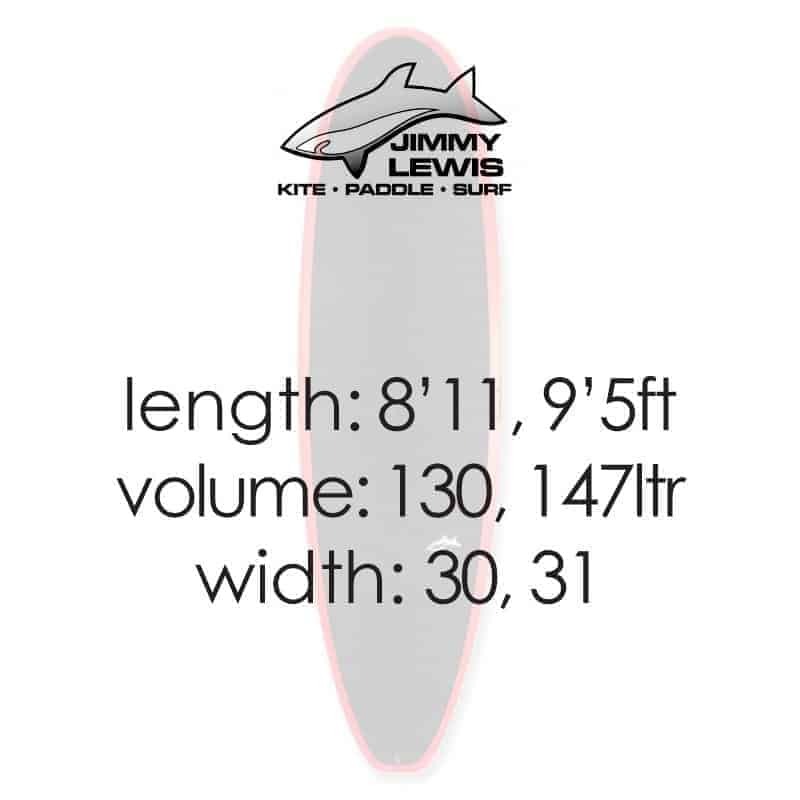 There are only 2 sizes in the Jimmy Lewis Striker range and to be honest there isn’t a need a for more as it is aiming at a certain type of rider – family / bloke upto max 95 kg if you’re competent on smaller boards. In that range it will do everything as you can see above surfing the wake of a boat. The 9’5 is 31 wide so is super stable and has 147 litres which is plenty for a bigger guy with good balance and certainly enough for ladies and kids whist the smaller 8’11 drops to 130 litres and only 29 wide so becomes a bit more tricky if you’re not experienced in riding smaller boards. That said it isn’t a punishing board even when you are bigger due to the nose and tail shape being rounded. Having a full deckpad is a blessing when it comes to just having fun in waves as it opens up a whole new box of tricks to play with so you aren’t gonna get bored. Let’s use me as an example: 40 yrs old, 85 kg when dry an very capable surfer. I want a board to just grab off the van, and dive into whatever is going off from clean to choppy, head high to ankle biters. This board works. 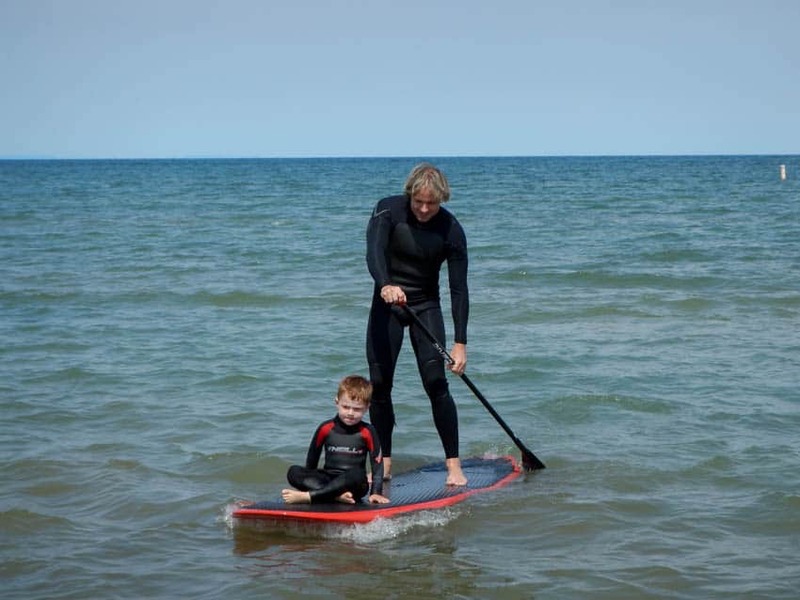 You got kids and you want to teach them to surf. Stick them on the front and paddle in with them letting them take the drop. My wife wants to surf and enjoy casual paddles out to chill. It is all the above with bells on so you can’t go wrong if you are after a one board quiver. I would certainly recommend the Jimmy Lewis Striker 9’5 for someone who wants everything, but if you’re a bit more surf focussed then the 8’11 will give that bit more growl.